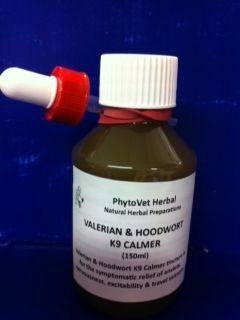 Valerian & Hoodwort K9 Calmer tincture is for the symptomatic relief of anxiety, nervousness, excitability & travel sickness. Invaluable to calm and relax dogs & cats suffering from excitability, apprehension, hypo-activity & phobias, such as those from fireworks, thunderstorms or gunfire. Does not cause drowsiness or impair normal behaviour or performance making it ideal for those needing to be settled for travelling, showing, training or obedience work. Given prior to a journey will calm nervous travellers and is useful where new surroundings or situations might cause apprehension or anxiety.